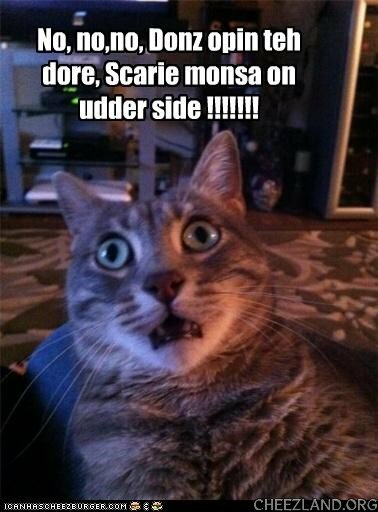 Kitteh haz seed dis moobie bi4! Ohai dere annipuss. Conga skardy kitteh mai frend. heers teh burfday fairy to say HAPPEE BURFDAY to Gillybean, Cheezburgerluver12 an evreewun else hoo haz a burfday today! i haz bringd yummy fudjy burfday caeks, lushus carrit caeks wif creemy creemcheez frosting, iskreem, sparkly party punch, baloonz, an goodie bags filled wif hoola-hoops that lite up wen they hoola, mini raysing splortscars, kandee, an fuzzy goggie stikkers wif googly eyes! an a big swish ob teh burfday wand to making all yor burfday wishes come troo! Happi birfdai tu teh birfdai peeplz! *noms lushuss carrit caek with eggstra creemy topping adn gathers toys to play with mai frends* Thnx b_f! Oh happy day two tjpz mumcat. Wivawt hur whee woodnt hav tkp. An dat wood b awlfilled. halp me an annipuss am stuk inn a endliss loop…….